CDC Warning...DO NOT DO THIS! Have you received this forward yet? The memo says "How to catch Swine Flu." I laughed so hard! Don't worry, we don't have pigs, yet. 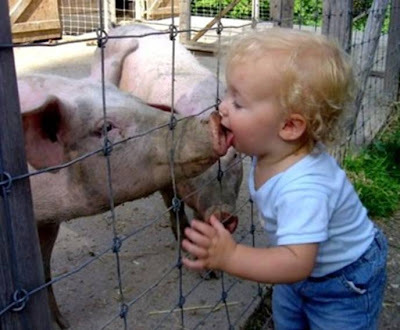 And if we did have pigs we would do our best to make sure no one licks them. Meet Hoppy. She recently injured one of her legs. We have no idea how. She has become very good at Hopping about. I have been doing some thinking... What if she never hurt her leg at all. What if she is just making a statement of support for Pretty Princess? She did seem to hang close by when Pretty Princess came outside for a visit. Kindred Spirits: Hoppy the Hen and Hoppy the Human. This post's photos are courtesy of our guest photographer, Lou Lou, who took pictures of the event with her Daddy's camera! Thanks, Lou! I would like to start this post off with a little history. First of all, I do not like running. I have never liked running and I will never like running. Or more aptly described "Slogging" as a friend of mine said recently (slow jogging). However, back in October, Rock Star, DW & Pretty Princess ran in a 2 mile race together. Due to my middle child nature I could not be left out. I worked like crazy until I could jog 2 miles. Then all four of us ran a race together a month later. It was exciting and it meant a lot that we did it all together. Mind you, not at the same pace, but all together none the less. We made the decision to run in a 1 mile race in DW's town in April. 1 mile sounds MUCH better than 2. In fact, I have no idea why a person would ever want to run 26.2 of them in a row. Yikes. When we got closer to the race we realized our four sisters would be down to two. As you know, Pretty Princess is recovering from a broken leg. I think it was an elaborate way to get out of the race. :) Rock Star is preggers again (and feeling awful) so she was out. Notice that everyone looks happy and relaxed but me. I am looking for a bathroom because my nervous peeing is starting to kick in. Our cheering section was present and accounted for. Check out those sweet smiles. It's good to know our crowd has enthusiasm! Boogie down boys! Here we are at the starting line. In true small town fashion the race was postponed so a soccer team full of little boys could get there. You gotta love it. Our cheering section waited patiently. They wanted to see us off so they could hit the playground for a few minutes. When the gun was fired we took off as fast as lightning. If there is anything fast about the slog! :) Turns out this course would be up hill, then into the wind and finally down hill. It was a test of my endurance for sure. DW was looking good, chatting and running with a friend just a bit ahead of Pop and I. Pop hung close and kept me moving. He would comment on the lovely weather or the neat looking building. He wasn't fooling me. I knew he was trying to distract me so I wouldn't pass out right there on the road. I am tickled now thinking about how I got to enjoy listening to "Brick House" on my MP3 player while Pop got to enjoy the sound of me having an asthma attack. We were nearing the last quarter mile when DW jogged back to join us. When we rounded the corner and started into the down hill I realized I was going to live. Then when we got close the the finish line and I could see that the time was still under 12 minutes I almost freaked out. My best time to run the mile was 13 minutes and 20 seconds. I was going to break my record people! I took off with all the energy I could muster. I looked over at Pop and said, "You better keep up!" Then right before the finish line I said to Pop, "I may have started that too soon." Dear Lord, I prayed, keep my feet moving until I cross that finish line. I am going to look like a huge dork if I stop now! He answered my prayer and DW, Pop and I ran to the finish line together! My best time at 12 minutes and 10 seconds!!! Rex and Tex are growing up and growing fond of each other. Here are pictures of their first adventure in the yard. We also set up a little swimming pool for them. Aren't they so cute! Things are really coming along! So we've done some more gardening, we planted 24 tomato plants...2 different kinds of cherry tomatoes, 3 "celebrity", 1 "Big Beef" and the rest are Better Boy. From what I've heard Better Boy are great tomatoes, and I figured 2 cherry tomato plants would be more than enough for our salads and such. I also heard that celebrity are good too, so we got a couple to try them also. We also planted to the left there 16 pepper plants. A green/red combo. 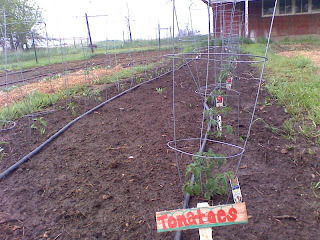 We also inherited all these cages, we had enough for all the tomatoes and peppers. We are about ready to plant the green beans..."Blue Lake Pole Beans" that is. 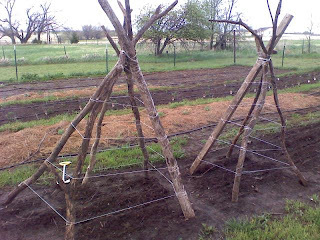 I read in the veggie bible that a great way of letting them grow and ease of picking is to put up Tee Pees as trellises. I just want to say that one Indian cannot put up a tee pee on his own. 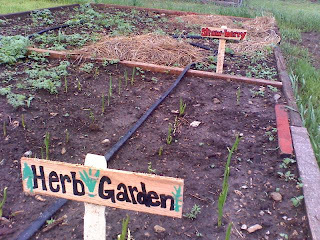 We have planted 4 rows of Garlic in our herb garden and we have around 35 coming up already in just over a week. As a bonus this should be more than enough for cooking and keeping away any vampires, or more likely warewolves...anyways bring on the Italian food! You can also see the strawberry area that we have going on. We also have lots of weeds on the left there. 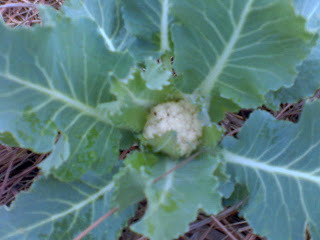 We have our first cauliflower popping out! How cool is that. On another note please notice my lovely wife's "CUTE" signs. She has made them for everything that we're putting in the garden...how cool. All in all it's pretty darn cool that the garden is going as well as it is. It's amazing to me to think about how God can take a small little seed and a plant grows from it with something that we can eat. And not only that but we're looking to get LOTS of food. As you may already know, Pretty Princess suffered a serious injury recently. Time has been hard to come by and blogging about this event just had to wait...but now it's time. Pop and I got one of the calls parents don't want to get in the wee hours of the night on April 11th from Romeo that Pretty Princess had been in an accident and he needed to know which hospital to take her to. He quickly added that it wasn't a car accident and had to tell us that they had been setting up a mattress on the floor for a friend of his who was spending the night and they were jumping on it...they got tangled up and he fell on her leg...they heard a pop and she was in a lot of pain. Romeo's older brother called their mom and dad who live nearby to get some help with this emergency and of course, Romeo's mom said they HAD to call Princess' mom and dad to find out where to take her for treatment. They loaded up the Princess (but not in a pumpkin carriage) and took her to the emergency room where they learned that she had multiple fractures in her leg and ankle and would require surgery which they scheduled for the following Monday. Pop and I discussed the best course of action for us knowing that a princess needs parental support for such an injury and decided to fly me out to help. I arrived at the local airport about 17 hours after the accident. Rock Star and the Superheroes picked me up and I arrived at Romeo's parents' home to find our Princess perched up on the sofa with pillows and pain medication. I was SO glad to be there and was made welcome as Romeo's folks gave up their master bed and bath to us. They made us feel so welcome and cared for...meals, medicine runs, and much more. 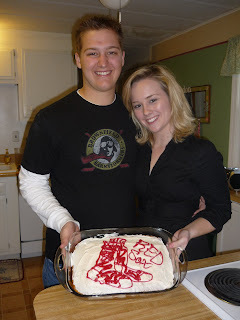 I might mention that we've been family/church friends for years so it seemed natural to be together through the ordeal. We've made some memories as a family that I won't embarrass the Princess with by actually recording them here...but they involve dozens of roses from Romeo, pain meds, silly questions by medical staff before the surgery, multiple pokes to get an IV started, blow up mattresses on dorm room floors, sharing her dorm with a fugitive and more. Romeo continues to warrant his nickname by sweet gestures such as holding a heavy text book while she studies (see pic above). He has vowed to see her as much as possible while she recovers. Which means a lot of driving since she cannot drive (it was her right leg). They live about 45 minutes away from each other so this will be a commitment. Of course the most popular comment about the accident involved "no more monkeys jumping on the bed." I told Princess and Romeo that I would most certainly be writing a children's book for their future kids about the ordeal...and let this be a lesson to all that your moms were right about not jumping on the bed!! Just ask Princess and Romeo. Update on the Garden of "not so Eden"
So we've done some major upgrading around the garden. First off we now have the well working and so we can now water the garden without using rural water. I have a timer on it so that when we're ready to start actually using it, it'll be done without me flooding the plants out because of my ADD. We haven't had to use it yet because we've had a couple of rather wet weeks, about 3-4 inches in that time frame. So I'll wait until the ground is good and dry and then crank this baby up! Again from my Veggie Bible, he suggests using natural weed barrier with newspaper and straw...well I just happen to have parents that have a daily subscription to the local newspaper and so I was able to layer it down and then put straw over all of it. This retains the moisture and keeps the vital sun from the weeds that would be germinating. You can see what the broccoli and cauliflower looks like popping through the barrier here. I've decided that next year I'm not going to keep grass paths between the beds, but instead put this same kind of layer down and that way I don't have to mow or weed eat with the possibility of hitting something that I want to grow. Here's a pic of my green onions, I have about 60 of them coming up now, which is about half of them, so we're almost there. You can also see the three other lines to the right, that's where I planted my carrots. I planted 3 rows at 30 feet each! So 90 feet of carrots! WOW...that was harder than I thought. I just hope that the rain immediately after sowing didn't wash them away. If we get a carrot every 2-3 inches then we'll have around 540 carrots!!! Lastly, who can say that they're a "TRUE" gardener without having a rain gauge. I finally pulled my big one, that I can read from about 2 miles away, out and feel much more ready to ponder whether to turn on the drip system with the rain we have got or not, now that I'll know exactly how much we actually got! Goin' Muddin' with Daddy...and Mommy's not invited!! So we got around 2" of rain Saturday night, and things were just horribly muddy and wet, but we have this new TOY ATV that was just begging to be used. So the cowboys and I went out and checked the grounds out...you know to make sure that everything was "OK". Sure enough things were a bit wet, muddy, and well, you know how boys are, they can't stay clean...this shot was taken with their shirts totally covered, however later they got their faces covered too. Rex in latin means "king", so it's only fitting that the largest duck is named Rex. Of course, it's kind of also a cowboy name and goes great with Tex. Tex and Rex; what great cowboy names. Here are a few pics of our new friend. Setting the Scene: Bubba is playing in the yard with his sheriff star on his shirt, his gun and holster on and a walky talky to his ear. Bubba: "We have Grammy...we don't want her to get away." So FCs friend had a co-worker that got a duck for her kids for Easter and they didn't want it, so she asked us if we'd want one...well they're coming out on Friday to deliver it, however you just CAN'T have one, it NEEDS a friend...so here's Tex; Rex is coming Friday. Silly boys those boxes are for toys! We went to DW's place for the morning. We needed to deliver eggs and that was an excuse to hang out! It's always a good time with cousins. I walked past the playroom and noticed a train had been created. Boys' minds amaze me! Bub, Bubba, Southern Gentleman & Wubba. Don't you love Bub's picture faces?!?! When we moved here we went ahead and purchased a bunk bed. We only use the lower bunk for Bubba and Wubba still sleeps on a crib mattress. (not a crib...he was jumping out of his and hurting his legs) Obviously, neither of our boys are old enough to be on the top bunk yet. Anyway, we turned the bunk bed so that the ladder is pinned against the wall. This way we can keep them from getting on the top bunk and getting hurt. That worked for about 9 months. Now they are regularly climbing onto the top bunk. They know they aren't supposed to be up there but it is just too tempting. After their Aunt's accident, I just can't take it. EJ will be helping me to take the top bunk down and store it. We are going to slide the second mattress under the bed and use it as a trundle. Problem solved. Praise the Lord! Pretty Princess' surgery went very well. They were able to repair the leg/ankle in one surgery. When the surgeon came out and gave the news you could hear a collective sigh of relief and a few tears. Thank you Lord! You are so good to us. Please continue to pray for healing. The picture below is of Romeo, Grammy & Romeo's mom calling to tell the good news! The youngest of the four sisters is having surgery this afternoon. She and Romeo will be able to laugh at all of this later...much later. They were being silly on Friday night jumping on a mattress that was placed on the floor for a friend. In all their "monkey jumping on the bed" glee they somehow got tangled up and Pretty Princess' leg broke. In three places. Romeo and his folks saved the day. They got her to the ER and then took her home (to their home) to take care of her. Grammy flew in immediately and they have all been nursing Pretty Princess through the weekend. Her surgery is scheduled for 1:00pm this afternoon. When I went over to visit last night I was impressed to see how Romeo was attending to his princess. He would carefully pick her up and carry her to the bathroom when she needed to go. As you can imagine hanging out with a broken leg for the weekend is incredibly painful. It sounds like no one is sleeping very well as they get up for pain meds, potty breaks, etc. Please pray that the surgeon will be able to completely repair the breaks in this one surgery. There is a possibility that it will require two. Pray that God will calm and comfort sis as she heads in to surgery. Pray the same for Romeo and the Moms as they wait. So we now have an ATV. As shown in the photos below. Oh what a fun thing this is. I get a permagrin when I am on it! And at 50 MPH I cry, maybe for two reasons, one is because the wind really just makes me, and the other is because I'm so happy! YAY!!! Here are the boys with me as I tote them around the farm and we go see the pond and take a tour of the place with the 4 wheeler. They love it too! They came to the farm in their totally awesome new truck. We took them outside to feed the chickens, gather eggs, show them the garden, etc. Little Wubba was proudly carrying around an egg which he decided would fit nicely in the tail pipe of the truck. Oh and he added a rock for good measure. We all had a good laugh and headed over there to retrieve the egg. No luck. Wubba's stubby little arms somehow pushed that egg too far back. Oh man! What happens when you have an egg in your tail pipe? I guess I never gave this much thought. Turns out a quick start of the truck and the egg (and the rock) flew right on out. Crisis averted! Okay, the cowboys are growing up before our very eyes. They are crossing over into "kids" and not babies anymore. Yikes! Although, my Wubba is still not 2 yet. Anyway, I am finding parenting more challenging. Imagine that?!?! Any other suggestions? Hook us up with some resources. Bubba was talking on my cell phone to his Daddy on the way home from the store. When Daddy said goodbye Bubba still wanted to talk. He continued his conversation with the political talk show host I was listening to on the radio. I got tickled as he responded to the statements that were made on the radio into the phone. At some point the talk show host said the word "accents" to which my three year old said. "Elmo says, Accidents happen and that's okay! Do you know that?" For those of you who don't speak Elmo...that is from a potty training video. Are you sure, because they, for some reason, are really comfy! My Romeo turned 20 yesterday! 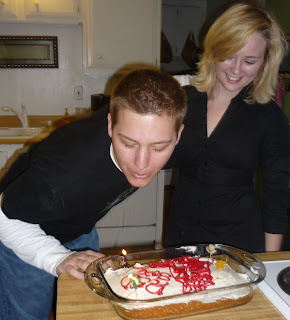 Farm chick made an excellent cake for his birthday celebration at the farm. ...and for my next toy, I would like an ATV, ok Pop? Ok so it's not the "pet" kind, instead it's the "toy" kind. OH WHAT FUN IT IS TO PLAY WITH MY BOBCAT!!!! I moved a mountain of dirt and limbs and grass today from the side yard to the burn pile. It only took me about an hour and I was done. It would have taken forever to move any other way. I'll also be able to pile more together the burn pile as it is and make it taller instead of so spread out. Oh the amazing things I will be able to do with this pet, oh I mean toy. Like when I have my 9 tons of manure delivered I'll be able to manipulate it very easily! The sweetest puppy I've ever seen! What? You don't hang out in the kitchen with your lion costume on drinking some juice and hanging on to a bouncy ball? Puppy got your tail? Take the Lion by the tail? A Spoon Full of Sugar!